Lyonia ligustrina.© 2002 Janet Novak.www.ct-botanical-society.org. (Accessed 7/2014). Lyonia ligustrina is a shrub to 4 m tall, usually much shorter; roots associated with highly specialized ascomycota ericoid mycorrhizae, (Allen1991). Leaves alternate, to 7 cm long, widest above middle, tip pointed, margins minutely toothed. Flowers white, vase-shaped, numerous, to 0.5 cm long; inflorescence umbrella-shaped, branched, at ends of stems; blooms June-July. Fruit dry, rounded with pale stripes, 0. 4 cm, numerous, eventually splitting open along stripes to disperse seeds, persistent through winter, seeds wind dispersed. 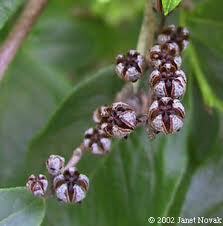 Lyonia ligustrina.fruit.© 2002. Janet Novak.ct-botanical-society.org. (Accessed 6/2014). 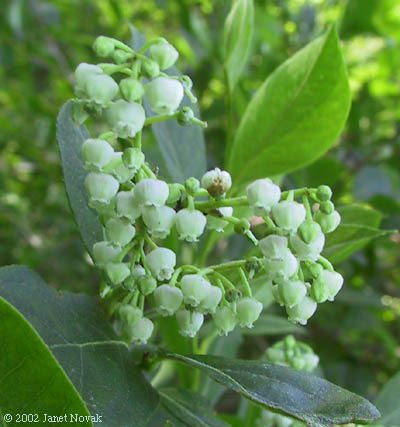 Habitat: Understory shrub in undisturbed swamp forests, pond edges, oak forests, acid soil, pH 4-6. Tolerant of flooding, salt, drought, soil compaction. Moderately shade tolerant (Hightshoe 1988).